The idea of the blogs "Journey to..." was to create a collection of new material about the visited experiments that mixes painting, drawing, photo, graphic design, video and new media. 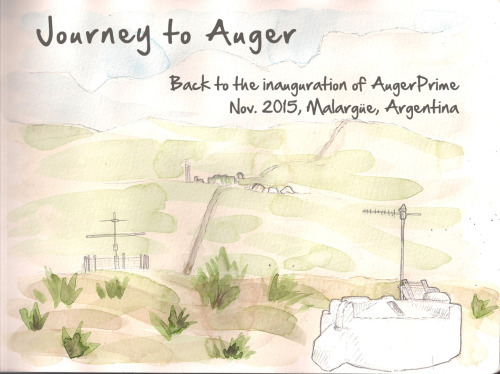 Journey to Auger is a travel diary about the celebrations of AugerPrime in Malargue, Argentina. In November 2015, the Pierre Auger Observatory has celebrated 15 years of achievements and signed a new International Agreement to run and upgrade the Observatory for the next ten years, so-called AugerPrime. Journey to Auger was co-written by Astrid Chantelauze, science outreach manager of the Helmholtz Alliance for Astroparticle Physics and Marie-Noëlle Rolland, freelance graphic designer. Journey to H.E.S.S. 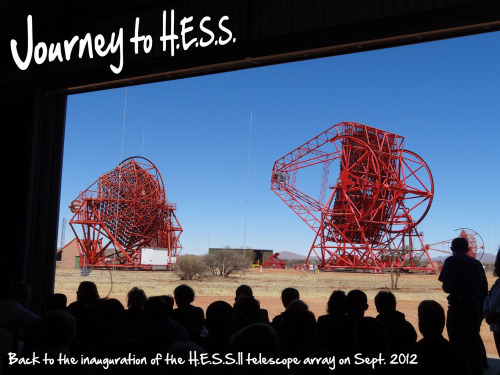 is a travel diary about the celebrations of the H.E.S.S.II telescope in Namibia. In September 2012, ten years after the inauguration of its first telescope, the H.E.S.S. collaboration made another major step towards exploring the high-energy Universe with the inauguration of the second phase of its telescope array. Journey to H.E.S.S. was written by Astrid Chantelauze, science outreach manager of the Helmholtz Alliance for Astroparticle Physics.